Cyprien Gaillard's work manifests in a variety of forms from videos and photographs to collages and sculptures. In his work, he reflects upon meanings and memories of monuments and landscapes that have been erased and replaced by the effects of time and social and cultural transformation. The artist investigates time and historical remembrance as demonstrated in forgotten monuments, wrecked ruins, and artifacts. During his residency at the Hammer, Gaillard traveled around California discovering hidden ruins, destroyed landscapes and other remnants of the recent past. This exhibition will feature an installation of recent sculpture and a series of photographs produced during his residency at the Museum. Hammer Projects: Cyprien Gaillard is organized by Ali Subotnick, Hammer curator. Cyprien Gaillard was born in Paris in 1980 and currently lives in Berlin and New York. He has had numerous solo exhibitions, including those at the Fondazione Nicola Trussardi, Milan; Schinkel Pavillon, Berlin (2012); Centre Georges Pompidou, Paris (2011, 2008); the KW Institute for Contemporary Art, Berlin; the Carnegie Museum of Art, Pittsburgh (2011); the Zollamt/Museum für Moderne Kunst Frankfurt, Germany; the Kunsthalle Basel, Switzerland (2010); the Kunsthalle Fridericianum, Kassel, Germany and the Hayward Gallery Project Space, London (2009). He has a solo show at MOMA P.S.1, New York on view through March 18, 2013. His work has also been shown in several important international group exhibitions, including the National Museum of Art Osaka, Japan (2013); the Kochi-Muziris Biennale in India (2012-13); S.M.A.K. Gent, Belgium; the Museum of Contemporary Art Chicago (2012); the Hamburger Bahnhof, Museum für Gegenwart, Berlin; the Mori Art Museum in Tokyo; the 54th Venice Biennale (2011); the Hirshhorn Museum and Sculpture Garden in Washington; the MoMA in New York; the ICA - Institute of Contemporary Art in Philadelphia; the Witte de With Center for Contemporary Art in Rotterdam; the Gwangju Biennale in Korea (2010); the Generali Foundation in Vienna; the Tate Modern in London; the White Columns; and the New Museum in New York; the 3rd Moscow Biennale (2009); the 5th Berlin Biennale (2008); and the Biennale de Lyon (2007). He has received many honors, including the Preis der Nationalgalerie für junge Kunst (2011) and the Prix Marcel Duchamp from Centre Georges Pompidou in Paris (2011). In 2009 he was an artist-in-residence with DAAD in Berlin. In his mesmerizing films, videos, collages, sculptures, and photographs, the French artist Cyprien Gaillard confronts the many contradictions of the built environment. Part twenty-first-century land artist, part amateur archaeologist/anthropologist, Gaillard has explored landscapes and cities, presenting subjects that include modernist tower blocks, Mayan ruins, brutalist resorts, and neglected urban spaces such as corporate plazas and train tunnels, as well as the often overlooked everyday ruins outside our front doors. Like his forebear the legendary land artist Robert Smithson, Gaillard is interested in entropy, and the word entropic often comes up in discussions of his work. Degradation, disorder, collapse—Gaillard doesn’t just look at these phenomena, he uses them as a starting block, and from there he uncovers the unnoticed consequences of such actions. What happens after the fall, the earthquake, the flood, the hurricane, the war, and the passage of time? How do we as humans relate to the world around us after dramatic events that significantly alter the landscape? 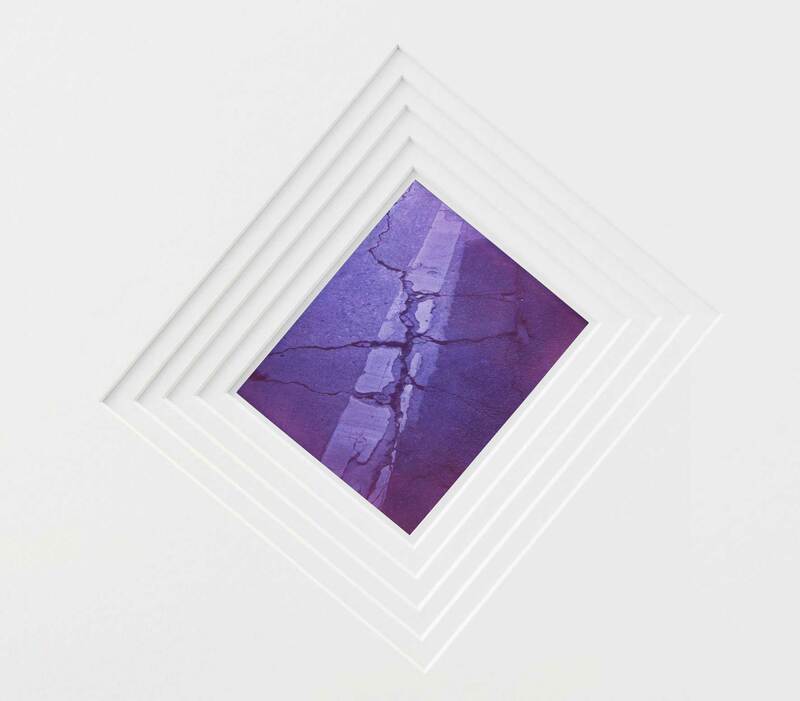 Decay, ruin, destruction, and natural disasters are all inspirations for Gaillard. Everything comes full circle, so there is no beginning and no end. Born in 1980, Gaillard was socialized in the digital age but also recalls when things were still analog. He transitions seamlessly between analog and digital without nostalgia or reverence for either medium. His film Artefacts (2011) was shot on his cellular phone and later transferred to 35mm film. The work has an aura of timelessness, and the use of film adds a layer of transience, as it is a medium on the verge of obsolescence, much like the crumbling, deteriorating, powerless cities ravaged by war and nature that are the subject of the film. Gaillard has been visiting demolition sites and looking at bulldozers and other heavy equipment over the past decade, and he wanted to get a closer look at the machines responsible for clearing rubble and erasing history. He visited a number of sites in the California desert where the industrial digging machines known as excavators are stored in huge yards. He zeroed in on the excavator attachments—yellow cast-iron tools that bear a striking resemblance to pre-Columbian artifacts. Gaillard refers to them as “teeth.” They are fragments of the larger excavator machines, resembling pre-historic artifacts. He took the parts to Berlin and had customized vitrines designed for them. 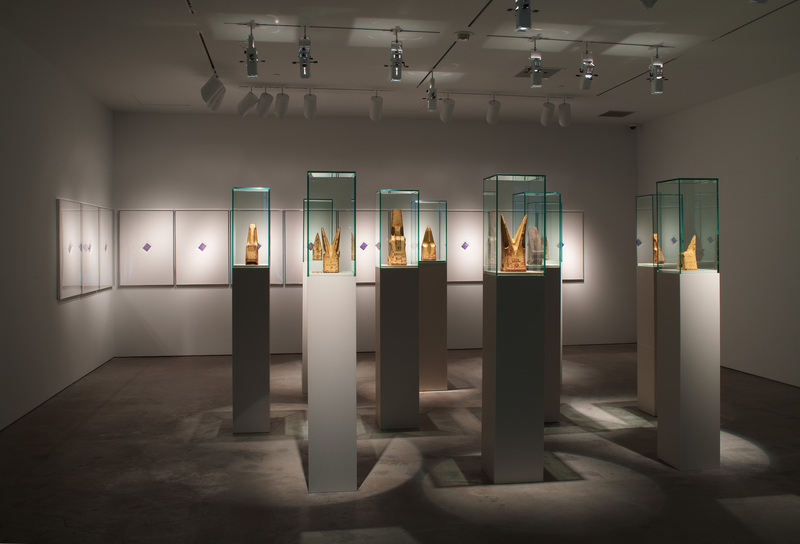 Installed in pristine, elegant display cases in an art museum, the “teeth” take on entirely new meanings, in a process similar to that in which artifacts are absorbed into museum collections and recontextualized. By removing these industrial tools from the demolition context and presenting them as high art, he reminds us to reconsider the preciousness of objects put on display in museums. Over time, they are imbued with an aura of history and symbolism, but many of these artifacts were once functional tools, just like the excavator teeth. Although many of Gaillard’s films and other works grow out of his globe-trotting explorations, some projects originate closer to home (in this case, a temporary home during the artist’s residency at the Hammer). While wandering around Westwood and the UCLA campus, he noticed all the cracks and fissures in the streets and sidewalks. 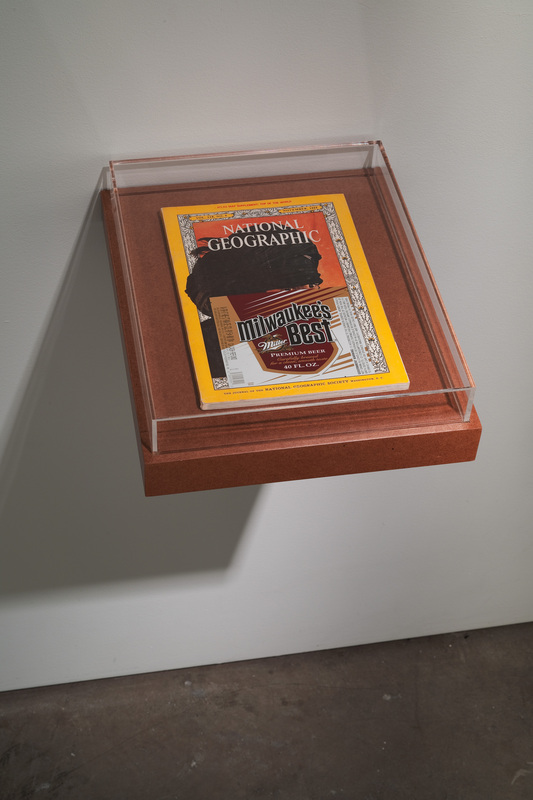 Interested in creating an index of these micro fault lines, he turned to Polaroid film, which provides immediate documentation since it is developed and processed on-site. Polaroid prints are fragile records, however: like the cracks in the road, which get paved over and erased, they have a limited life span, fading over time. Gaillard has been using Polaroid photos for more than a decade now as an almost signature medium. 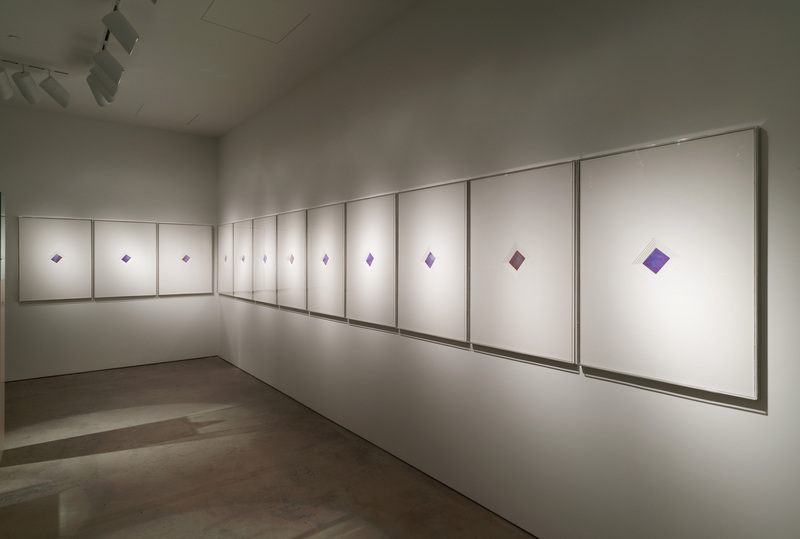 He displays the photos at an angle, so they look like diamonds, often set inside a beveled white mat board. Occasionally single photos are presented, and at other times they are arranged in groupings, also forming a diamond shape. From his own experience with Polaroids, Gaillard knew that varying the temperature during the developing process could alter the final photograph. For example, if he put the photo against his warm skin, it would come out with warmer hues, and conversely, in cold conditions, the photos turned blue and purple. 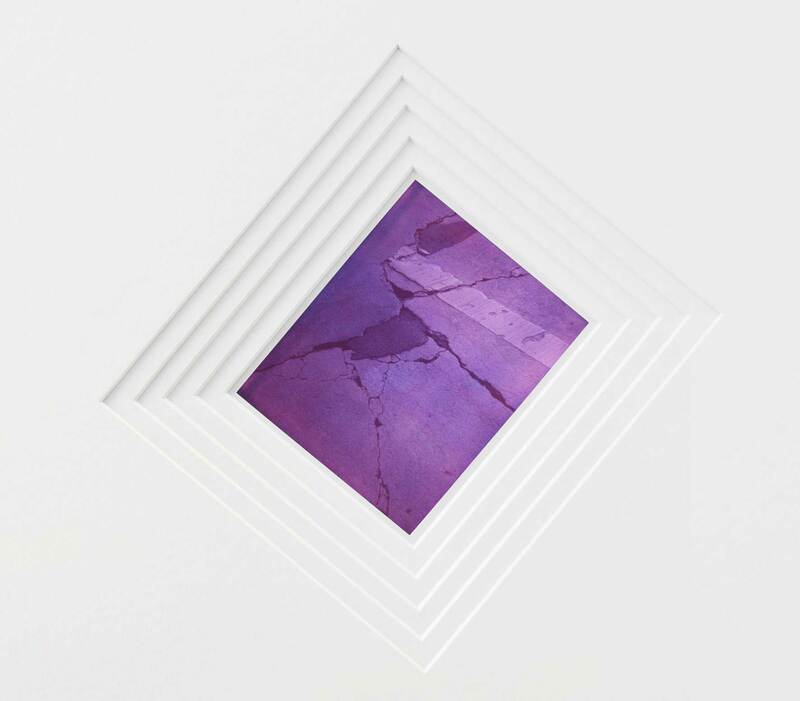 For his project in Westwood, Gaillard brought along a cooler of ice, often used by the fraternity boys on campus, and as soon as the photos came out of the camera, he dipped them in the cooler so that the prints developed with intense purple and blue hues. The process links contemporary college life with the Ice Age, but it also adds a layer of aggression to this documentary act. The photographs become almost completely abstract, records of nature’s power over man. 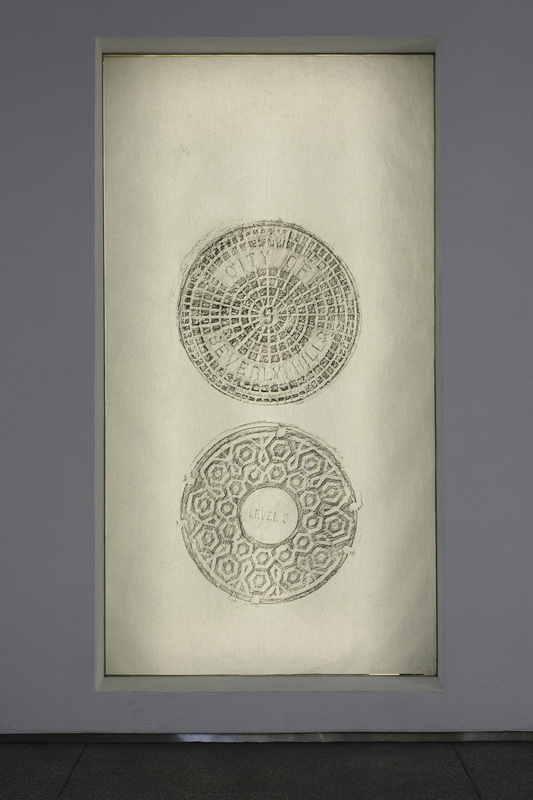 While working in Los Angeles, Gaillard identified further evidence of colliding times and cultures on the city’s streets: the manhole covers. He noticed that these industrial lids not only share motifs and patterns with pre-Columbian art but also bear texts that give them another layer of disorentiation. The legend “City of Los Angeles” is often followed by “Made in India” in equally prominent type. Gaillard took it upon himself to record these undercover monuments, employing an ancient mode of recording—frottage. The intrepid artist ran into the streets to obtain rubbings of the manhole covers, creating his own indexes of a specific time and place. The rubbings recall Olmec images of heads and mythical creatures. Gaillard calls the series Gates, which emphasizes the manhole covers’ function as barriers or gateways: in real life, they may lead only to the city’s sewer system, but in movies and fiction they often serve as portals to an underworld or as secret passages to the other side of the world. Drawing parallels between different cultures and places through architecture, youth culture, and industrial tools, Gaillard is a modern-day version of the explorers going off to foreign lands who bring back fragments of other civilizations. And the act of extracting and recontextualizing these objects and fragments from their regions or origins results in geographic dislocation. Whether he is capturing freshly paved concrete or neglected desertscapes, he is a tireless excavator and recorder of our recent history, creating works that encourage us to see the world anew. Hammer Projects: Cyprien Gaillard is presented through a residency at the Hammer Museum. The Hammer Museum’s Artist Residency Program is supported through a generous grant from the Simms/Mann Family Foundation. The residency program was initiated with funding from the Nimoy Foundation and is supported through a significant grant from The James Irvine Foundation. Cyprien Gaillard’s residency also received major support from the French Cultural Services and the Flax Foundation. Generous support is provided by the Los Angeles County Board of Supervisors through the Los Angeles County Arts Commission and Susan Bay Nimoy and Leonard Nimoy. Additional support is provided by Good Works Foundation and Laura Donnelley; the Department of Cultural Affairs, City of Los Angeles; the Decade Fund; and the David Teiger Curatorial Travel Fund.